As might be expected, new, updated versions of tutorial books and training discs have been hitting the market. 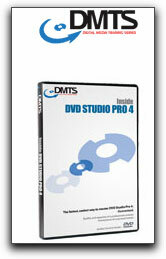 "Inside Studio Pro 4", an updated version of DMTS's tutorial DVD of "Inside DVD Studio Pro 3" which are both included in your order was a pleasure to use. Zeth Willie who speaks with a clear, easy to understand tone and pace, narrates the tutorial. I have listened to other tutorials where the presenter spoke so quickly it was hard to follow. That's not an issue here. The first disc, Inside DVD Studio Pro 3 takes the user through the entire gamut of DVD production from beginner usage which covers project planning, importing audio, video and stills, working with buttons and finalizing the finished DVD. The disc then moves to a more intermediate level teaching you how to create Overlay Menus, button navigation, subtitles and transitions before moving to more advanced topics covering the use of alpha transitions, creating scripts, subtitle buttons and much more. The next disc is separated into 4 sections and focuses on the new features found and topics presented Inside DVD Studio Pro 4. Zeth Willie and the Digital Media Training Series folk do a more than commendable job focusing on HD and HDV production. Want clarification? This is the place to go to. In the second section, encoding HD content, building and designing an HD or Hybrid DVD project is subject before moving onto the next two sections which teach you how make several improvements to your workflow through VTS allocation, using Dual Layer DVD-Rom and linking to loop points. There is also an excellent section on Motion Integration, which I found very useful. As I revealed in my recent review of DMTS's "Inside Final Cut Pro 5", this tutorial disc contains a massive amount of media. After all, to get through the entire two discs you will need over 12 hours of time on your hand. Certainly you will break that up into however much time you want as you move along chapter by chapter. With over 46 lessons on DVD SP 3 & 4 you will not get through this quickly but you will learn it very thoroughly. The point is that within this comprehensive package you will be able to access the individual movie chapters separately, should you desire, as well as the project files that DTMS supplies to move forward while making your DVDs. All in all, what we have here is an excellent updated version of an already fine DVD tutorial on DVD Studio Pro. The media supplied with the disc was well shot and easy to use. Most importantly, it was a simple thing to follow along, go back to 'hear it again' and where I had questions, the tutorials provided the answers. Users from complete beginners to the more advanced will find plenty here to utilize. That's a pretty good recommendation in itself.